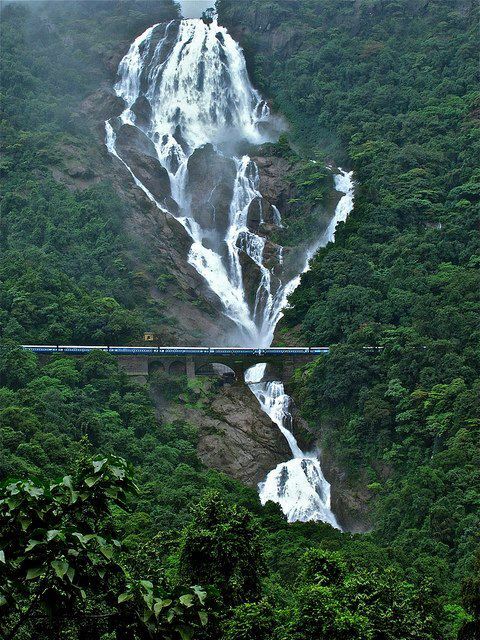 Dudhsagar Falls is a tiered waterfall located on the Mandovi River in the Indian state of Goa on Goa's border with Karnataka state. It is four-tiered. It is 60 km from Panaji city by road and 46 km from Madgaon railway junction by train. The waterfall is located in the Bhagwan Mahavir Wild Life Sanctuary at Collem in South Goa in the western ghats. The waterfall is on the border of Karnataka and Goa states. The roads leading to it are maintained by the Goa Forest Department. A small resthouse is maintained in the forest by the Karnataka Forest Department and is the only place to stay there. The roads are closed in the rainy season of June to September as fast-flowing streams cross the roads and make them dangerous to drive. The roads are again opened in the month of October. At the base of the waterfall, there is a small pond. One can bathe in it only during non-rainy days, that too at one's own risk. However, such a risk is not advisable. There are fish in the pond, the water is very cold and the pond is slippery.